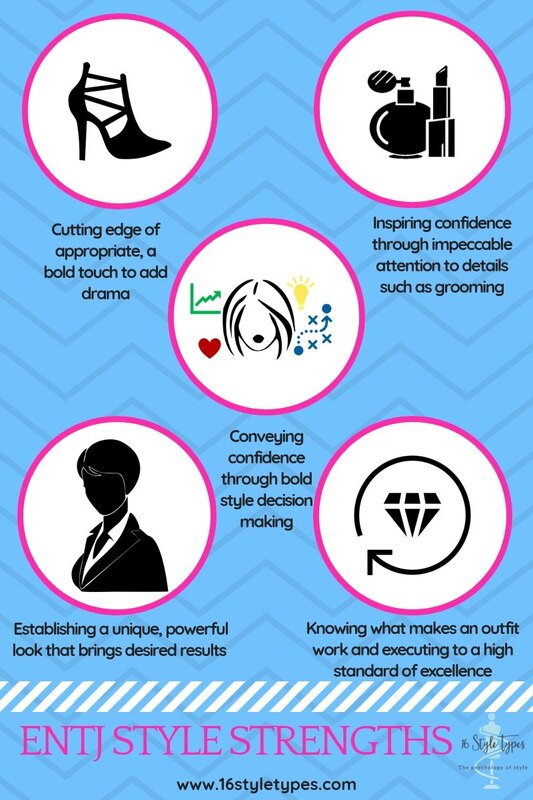 Competitive, productive and powerful, Style Powerhouse ENTJs capture our attention. They are highly visible, and often capitalize on that visibility with their striking style strengths. Style Powerhouse ENTJs more than any other of the 16 style types, convey striking confidence. It’s part of their DNA, they come by it naturally. It’s the combination of that Extraverted Thinking supported by their inner vision, their trusted iNtuition, that adds up to such a punchy presence. Walk into any room and you’ll notice the Style Powerhouse ENTJ. In fact, our ENTJ interviewee said exactly that: she can walk into any room and spot her fellow ENTJs in a flash. It’s what makes them so good at being in charge. When applied to her style, the Style Powerhouse ENTJ strikes a bold and dramatic look, strong colors, high contrast, metal and spikes and angles and designer black and anything else that keeps our eyes on them. Along with other TJ style types, Style Powerhouse ENTJs are turned on by getting things done. Done quickly, done expertly, and done with aplomb. There’s a touch of the dramatic here – they don’t mind a parade. After all, they’ve done a brilliant job. And style fits into this equation – it’s a tool (other T’s see style this way too) and it should be used. And like other things ENTJs use, they use it fully, expertly, dazzlingly. Nothing is every half done. Other Judging style types are also decisive, but the E-TJ combination here makes Style Powerhouse ENTJs especially decisive. They can make 10 decisions before their feet hit the floor in the mornings, including the most powerful outfit to achieve the day’s (many-faceted and quick paced) outcomes. There’s no point doing it if you can’t be great at it, that’s what ENTJs think. Excellence is the hallmark of other TJ style types, but Style Powerhouse ENTJs take this to a height through their intelligent and glossy approach to achievement. They’ll buy the best quality they can afford (or maybe slightly beyond), especially if they’re certain an item will give them the power boost they’re seeking and are the style type most likely to seek out designer, cutting-edge pieces. Even when relaxing outside of work, there’s a deluxe, elite element to their look.